I picked this book up immediately upon finishing the first, and I’m happy to report that Her Majesty’s Necromancer is just as page-turning. There’s more of everything I loved about the first book. Charlie’s really coming into her own, she’s determined to prove that she can be an asset to the Ministry rather than just their token necromancer. She’s learning to accept her abilities, instead of being afraid of them. I already loved her, but she’s just really morphing into this incredible character. This second book also gives the reader some more insight into Lincoln’s history and character as he tries to balance the demands of the ministry against his growing affinity for Charlie. Their relationship takes on an awkward and interesting dynamic in the book as now that her ordeal from The Last Necromancer is over, she’s accepted a maid’s position so that she can remain at Lichfield Towers. Yay for weird tension! 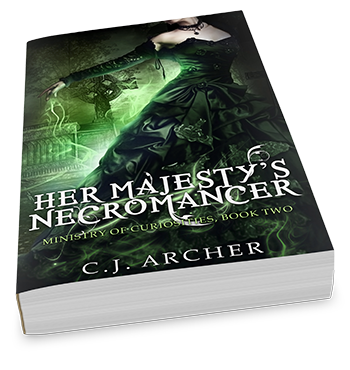 While still a character/relationship driven book, Her Majesty’s Necromancer shifts its focus somewhat from the first book’s in that the mystery and action come more to the forefront. Especially since Charlie takes it upon herself to do some independent investigating, and the story maintains a pretty breakneck pace throughout. Also of note, the situation with the Ministry and the committee continues to be… ominously interesting. Overall, Her Majesty’s Necromancer is an excellent historical urban fantasy that I just couldn’t put down. I’m thrilled that you’re enjoing this series – I’ve had my eye on it and have been so curious!! The HR and UF mix are some of my favorites and those covers just draw me in. I hope you give it a try! Cannot WAIT for the third book to come out!